Unless you have 3 ovens, an 8 burner stove and 2 sous chefs, Thanksgiving dinner is probably a real pain to plan and coordinate. Not only do you have to plan which recipes to make, but you also have to figure out timing and which kitchen resources you can dedicate to certain dishes. Almost always, I’m out of an oven due to the turkey, which takes priority. I usually bake any caserole dish right after as the turkey cools. Mashed potatoes are made on the stove along with gravy and pan roasted veggies. It’s a crazy balancing act of checking timing and temperatures and making sure nothing catches on fire. So, any time I can make something the day before and can cook day of without giving up precious stove or oven real estate, I’m all over it! 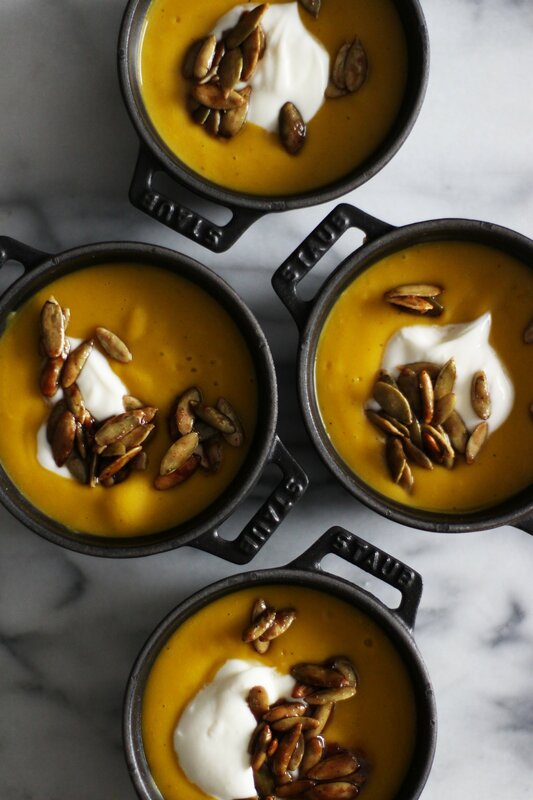 That’s where the Vitamix Professional Series 750 comes in and this incredible kabocha squash soup. 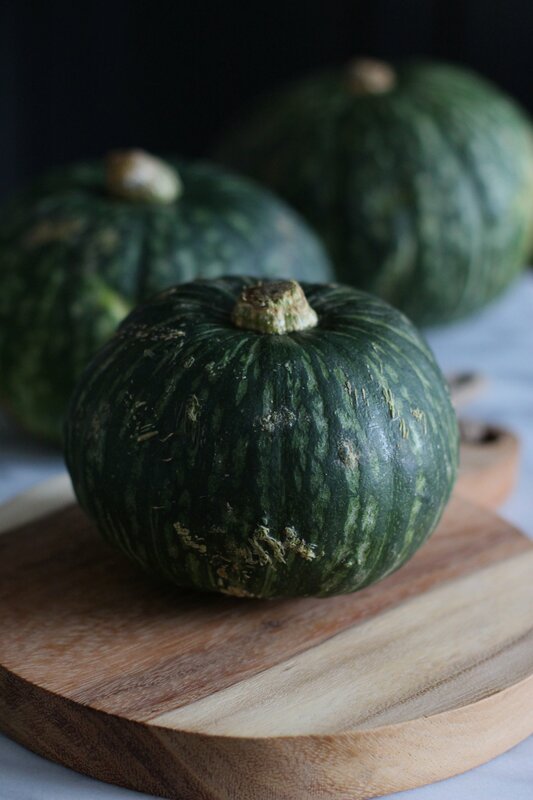 For those of you unfamiliar with kabocha squash, I’ll tell you there is no better squash, in my humble opinion. 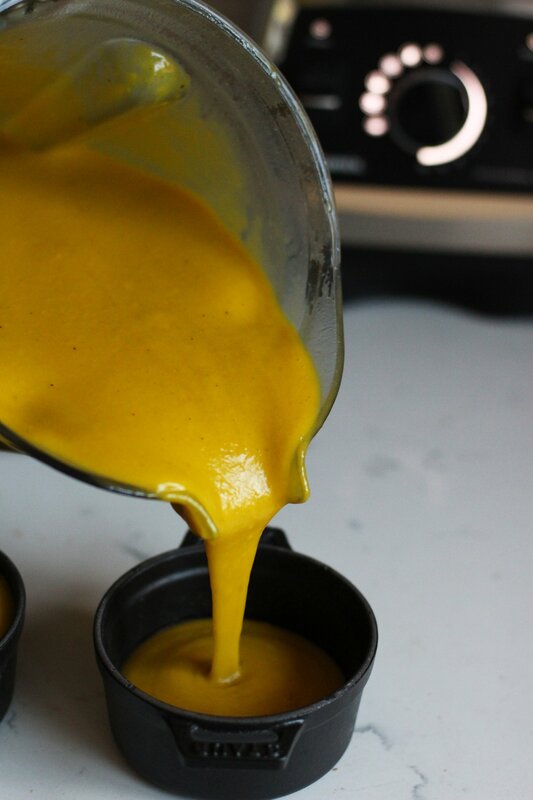 It has so much sweet squash flavor and has such an amazing creamy but firm texture. 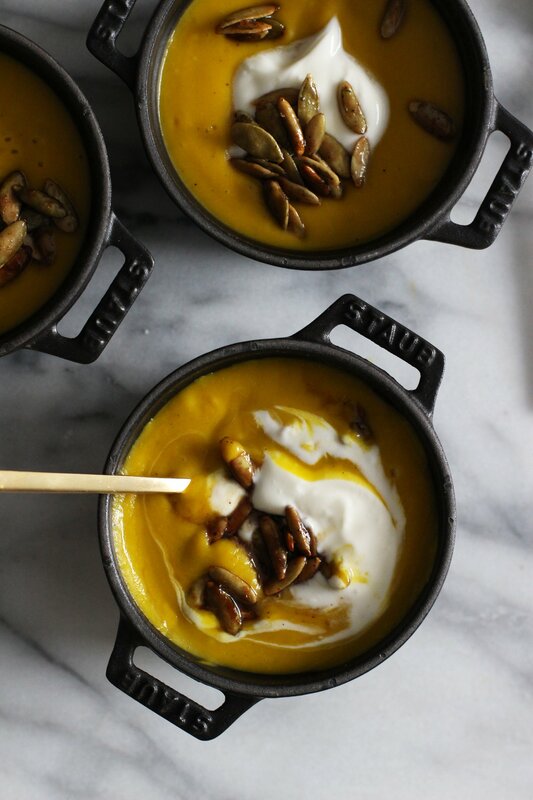 If you’ve only made butternut squash or acorn squash, I suggest you make the switch– you’ll never go back. The best part of this recipe is that you can roast all the vegetables the day before, pack them in a container and right before you’re ready to serve your big Thanksgiving meal the day of, transfer all the veggies and the rest of the ingredients into your container and blend away! 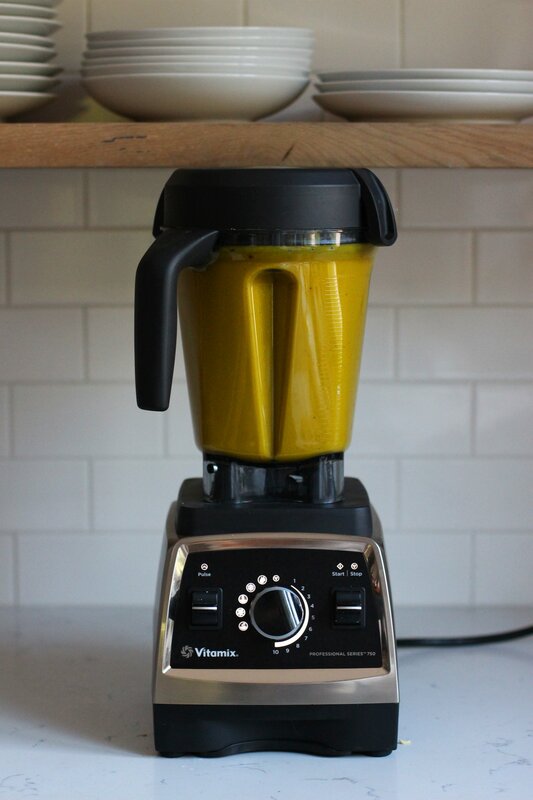 Vitamix is specially engineered to create hot soup; no stove required– how amazing is that? No extra pots, no sweating over a hot stove and no mental breakdown because you burned the stuffing and are a big sweaty mess. Or at least we hope not! Preheat the oven to 400 degrees. 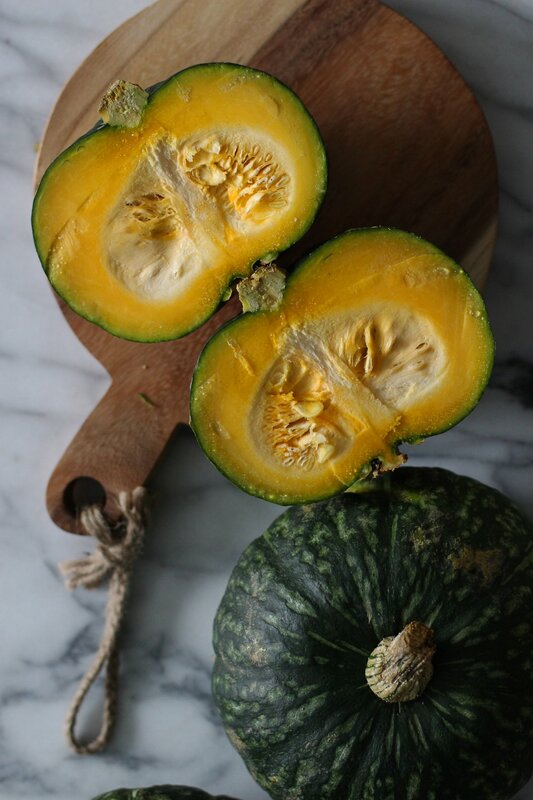 Peel the kabocha squash and scoop the seeds out with a spoon. Dice into 1-2 inch cubes. Cut the onion into 1/8th wedges. Toss the vegetables with the fresh thyme and cover in a few glugs of oil, a heavy pinch of salt and few rounds of freshly ground black pepper. With clean hands or tongs, toss the vegetables until they’re all coated evenly. 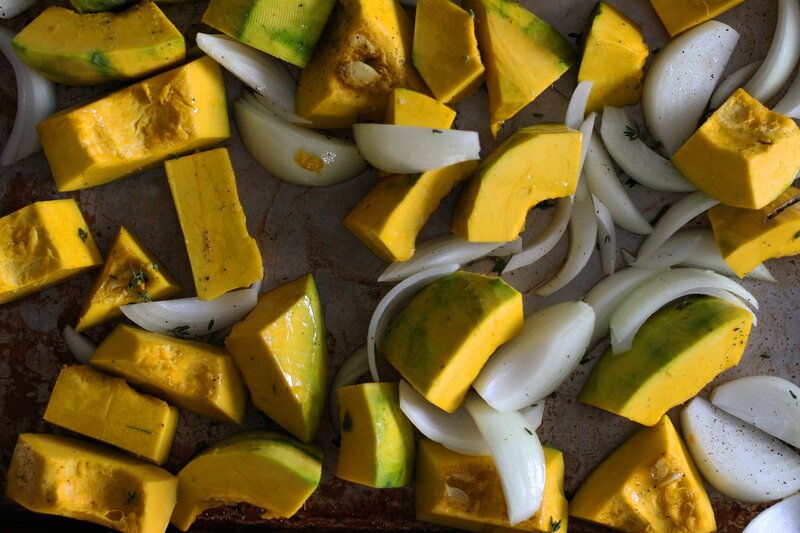 Roast for 15 minutes, turning them halfway in between, until the kabocha is softened and can be easily pierced with a knife. 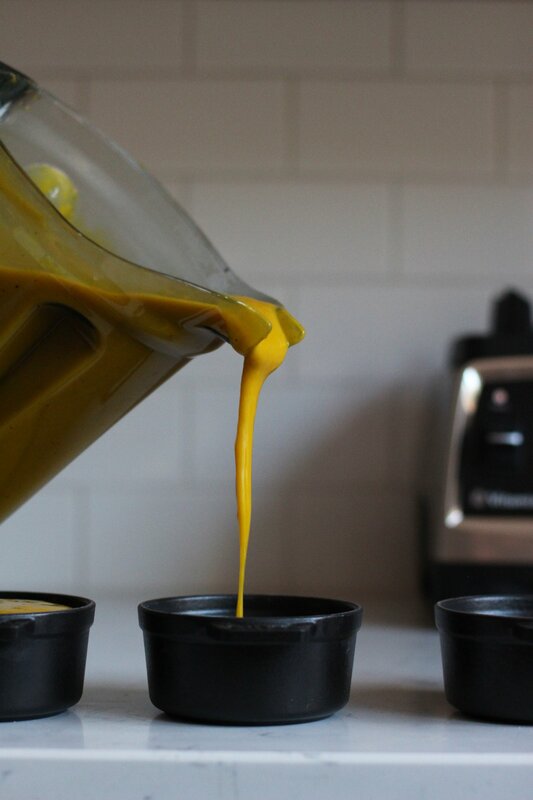 Transfer the vegetables to the Vitamix container and add the chicken stock and nutmeg. Select the soup preset and it will run the cycle. Taste to see if the soup needs more salt and season accordingly. To make the spiced pumpkin seeds, melt the butter in a pan, add the pumpkin seeds and cook over medium high heat until the pumpkin seeds begin to toast. Add the spices and a pinch of salt and the brown sugar and maple syrup. Toss to coat and lower the heat to medium and cook for another 3 minutes until the consistency is thick and syrupy. Spread out onto a piece of parchment paper and allow to cool and harden. 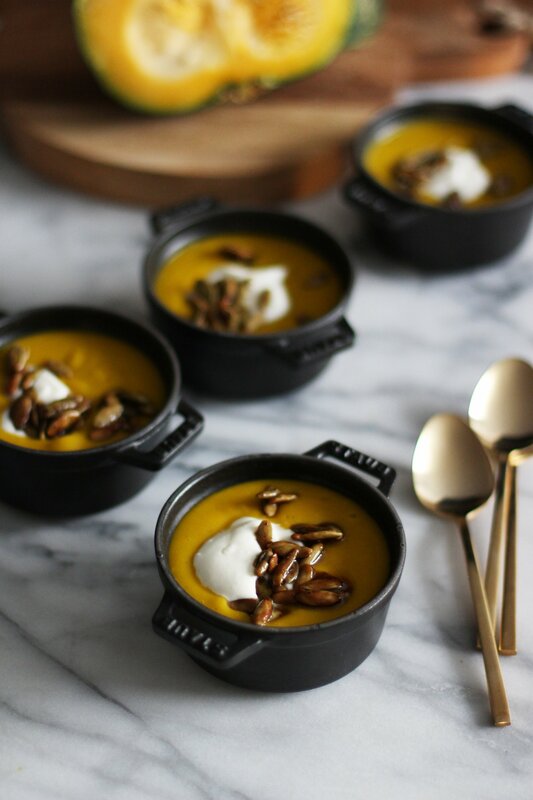 Assemble your soups by topping each bowl with a dollop of creme fraiche and a cluster of spiced pumpkin seeds. This sounds incredible! I love that the pepitas have a bit of sweetness to them. A Vitamix is essential for Thanksgiving! This soup sounds delicious. 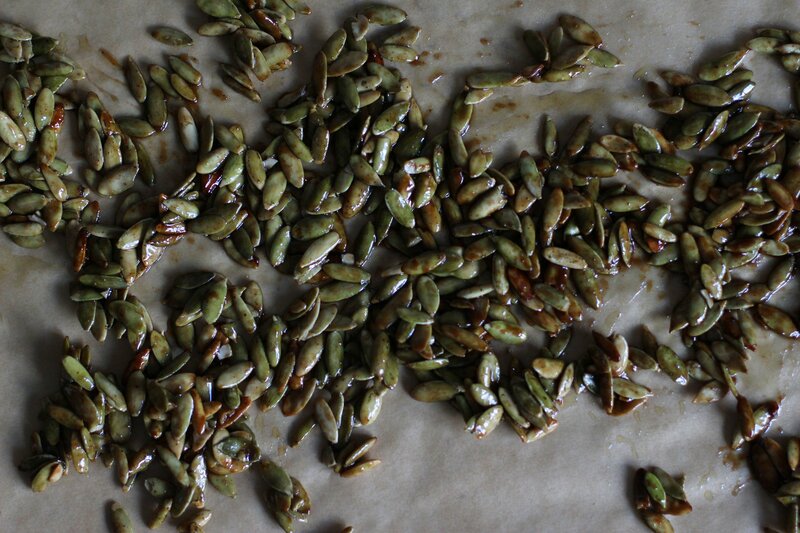 I especially love the candied pepitas, I will probably make those once just as a snack. 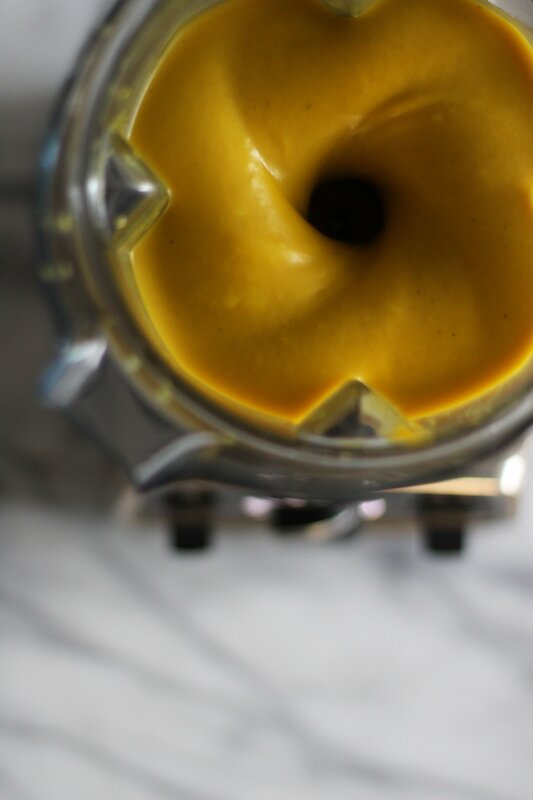 the vitamix is key to thanksgiving success! 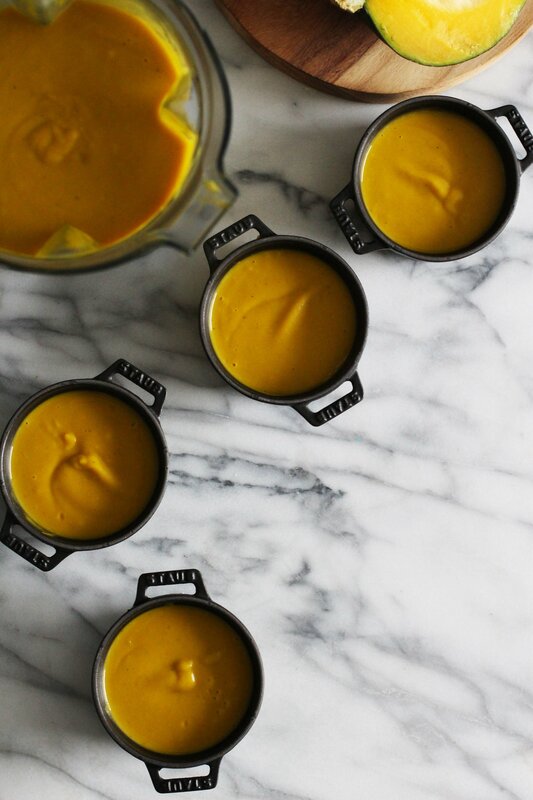 the color of this soup alone makes me want a giant bowl! There’s a freezing wind blowing and all I want is a cozy bowl of soup like this!